Supreme Court Associate Justice Francis Jardeleza on Monday accused Chief Justice Maria Lourdes Sereno of having committed treason after she objected his nomination by the Judicial and Bar Council because of his objection on the issue of West Philippine Sea, an information Sereno should not have had in the first place. Jardeleza at the impeachment hearing, said Sereno obtained and "illegally secured" a top-secret document and made it a basis for the rejection of Jardeleza in the shortlist of nominees for the SC in 2014. The “top-secret” document was Jardeleza’s March 2014 memorandum which cited reasons to exclude the Taiwanese-occupied Itu Aba from Manila’s arbitration case against China. He said that the case was purely executive in nature and that the judiciary had no part in it. Thus he said, the question is, how did Sereno manage to get the information? Jardeleza won that case against Sereno. 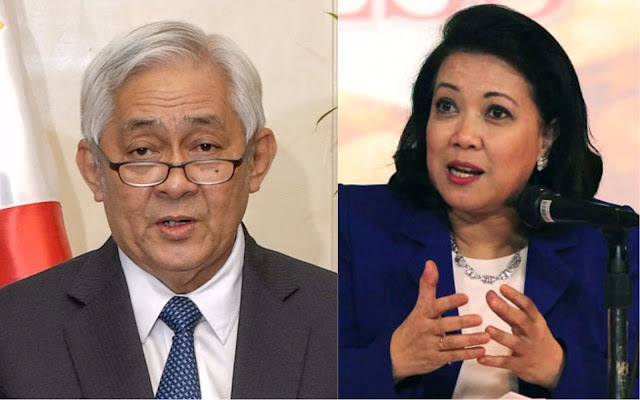 Two other incumbent Associate Justices and a retired Associate Justice denounced Sereno’s unilateral decision over an en banc decision pertaining to the transfer of Maute cases. The other Justices who testified against Sereno were Associate Justices Noel Tijam, Teresita Leonardo-de Castro, and retired associate justice Arturo Brion. Tijam's concerns were Sereno's failure to act promptly on the request of the Department of Justice to transfer the venue of trial of cases against members of the Maute terrorist group. He said she also kept the court en banc in the dark on crucial information that could have allowed speedy disposition of the case. "The Chief Justice is not the Supreme Court. In other words, unlike the chief of a tribe in a community, the chief of a conglomerate, the chief of a group of companies, Sereno could not overrule, supersede or cancel the decision of the en banc,” Tijam said. Meanwhile, De Castro denounced Sereno’s unilateral action without consulting the en banc. “I believe that the actions done by the chief justice from the time that she resumed her position showed no respect or courtesy to the court en banc,”she said. Atty. Larry Gadon, the impeachment complaint, alleged that Sereno committed culpable violation of the Constitution when she manipulated and delayed resolution of Aguirre’s request on the transfer of venue of Maute cases. According to Tijam, on June 13, Justice Secretary Vitaliano Aguirre sent the SC a letter seeking reconsideration of the June 6 resolution. The next day, the Office of the Court Administrator issued a report and recommendation to transfer the Maute cases out of Mindanao. He said the Chief Justice never submitted these letters to the en banc. Tijam said being chief justice did not mean having absolute powers because even the matter of purchase of vehicle, as well as the matter of going on official leave, had to be submitted to the en banc. The Associate Justice added that while Aguirre submitted the initial request for the transfer of the Maute cases outside of Mindanao as early as May 29, 2017 for security reasons, the court en banc actually granted it only on Aug. 8, 2017. “It is important for the en banc to consider matters of urgency. And we can only consider these matters of urgency if the en banc is given full information, immediate information, complete information,” Tijam said. Tijam said that the CJ only disclosed all necessary information during lunch. “But there is distinct difference between discussing something important during the en banc session where you have the docket folders, you have the materials with you, and holding a caucus on an important matter where in front of you are forks, plates and food,” he said. Brion echoed the sentiments against Sereno. “We are a very small group in the Supreme Court. ..You are getting what you want through these devious means that are not right,” Brion said..